Coast Salish tribes believe the Creator gave their people cedar as a gift. Traditionally, a prayer was offered to honor the spirit of the tree before harvesting its bark, branches and roots. Their ancestors taught them the importance of respecting cedar and understanding how it is to be used, so that it will be protected for future generations. Cedar was the perfect resource, providing tools, baskets, bowls and carvings in addition to having medicinal and spiritual purposes. 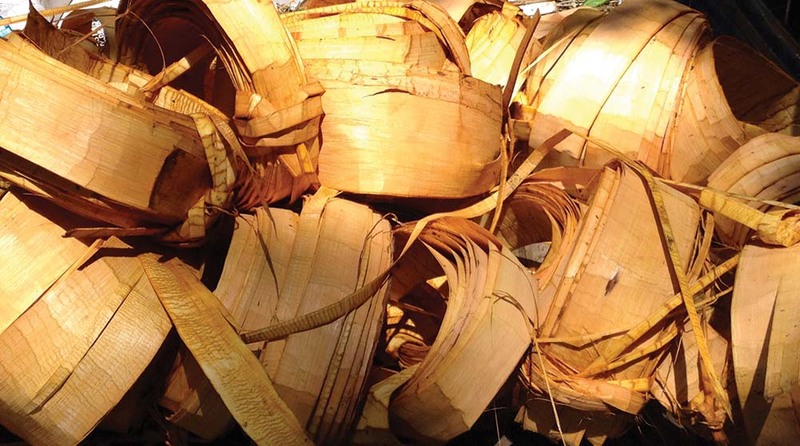 The highly sought after inner bark was separated into strips or shredded for weaving. The processed bark was then used like wool and crafted into clothing, baskets and hats. Those same traditional teachings are practiced today and passed down to the next generation. 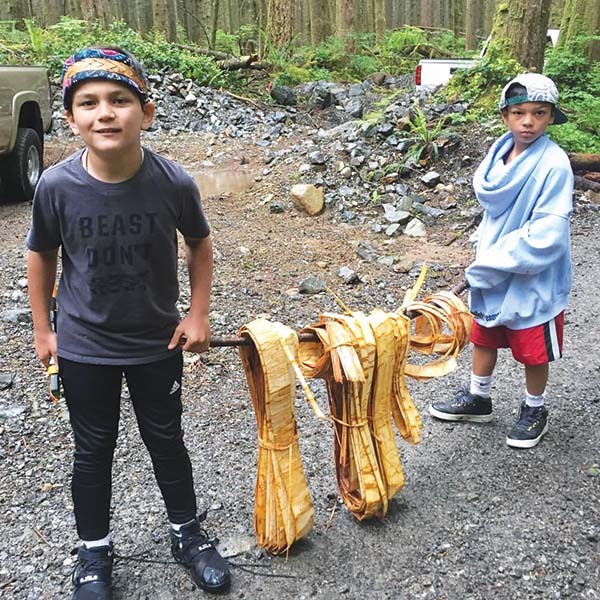 Over the weekend of June 15, the Tulalip Tribes membership was given the opportunity to participate in the cultural upbringings of their ancestors by journeying into their ancestral woodlands and gathering cedar. 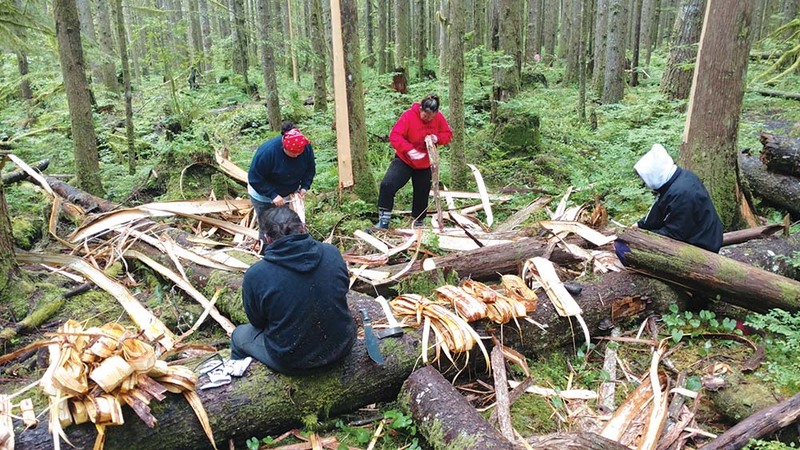 Led by Forestry staff from Tulalip’s Natural Resources Department, participating tribal members ventured just north of Sultan to Lake Chaplain, located on the outskirts of the Mount Baker-Snoqualmie National Forest. The annual cedar harvest showcases a partnership between several agencies working as a team to coordinate this culturally significant opportunity. The Tulalip Natural Resource’s Timber, Fish, and Wildlife Program generally arranges a cedar harvesting site for the upcoming season by utilizing existing relationships with off-reservation landowners and the Washington State Department of Natural Resources. “We have grown and maintained a wonderful working relationship with the Washington State Department of Natural Resources (DNR), who provides opportunities to pull cedar bark from trees within DNR’s timber stands that would otherwise not be available to tribal members,” explained David Grover, Tulalip Tribes Forestry Program. “Having opportunities not just to acquire the bark itself, but also to spend time practicing the cultural tradition of harvesting from the cedar trees, and passing that tradition on to the tribal youth is invaluable for the tribe. “This [opportunity] also offers the DNR foresters that help us on site during these events a chance to gain a better understanding of the forest resources they manage, as well as a unique glimpse into the different types of relationships people have with those resources that are not tied to timber sales,” added Grover. The relationship Coast Salish peoples have with cedar cannot be understated. Our ancestors relied on the magnificent tree as an integral part of their life on the Northwest Coast. From birth to death, the powerful cedar provided generously for the needs of the people – materially, ceremonially and medicinally. Those teachings have not been lost. Master weavers, elders, and youth alike all echo the very same cedar harvesting technique employed by their ancestors. 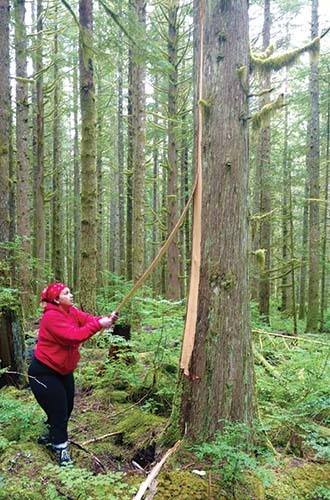 With a small ax and carving knife, they skillfully remove strips of bark from designated cedar trees. They then shave off a small section of the rough bark, revealing a smooth tan inner layer. After harvest, the cedar strips are typically laid out to dry for a year before being made into baskets and hats or used in regalia. 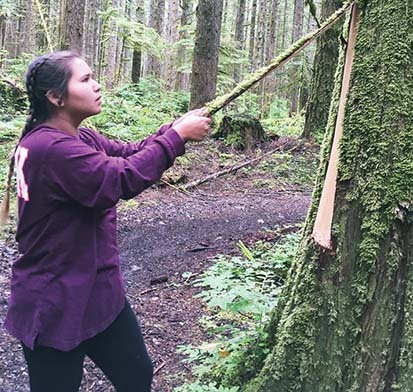 Many Tulalip youth participated in the three-day cedar harvesting event, gathering strips for elders and learning techniques of separating the smooth inner bark from the rough outer bark. 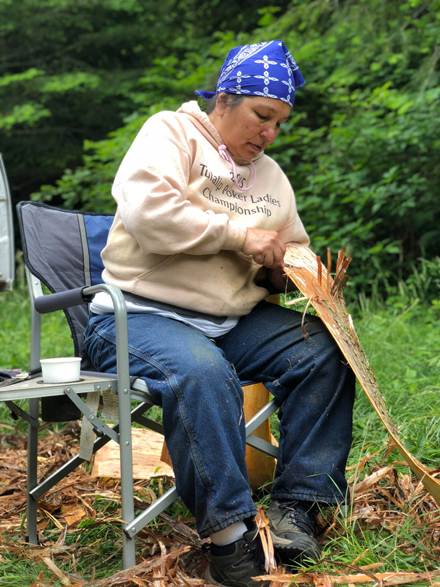 For some tribal members it was their very first trip to gather cedar, while for others it was another step in the continual journey to connect with the spirits of past and present. “Thankful for Natural Resources and the Rediscovery Program who constantly advocate and work hard so we can have access to gathering locations,” shared tribal member Theresa Sheldon. “Their work is appreciated and much needed as more and more traditional areas are being gated off and made harder to access. 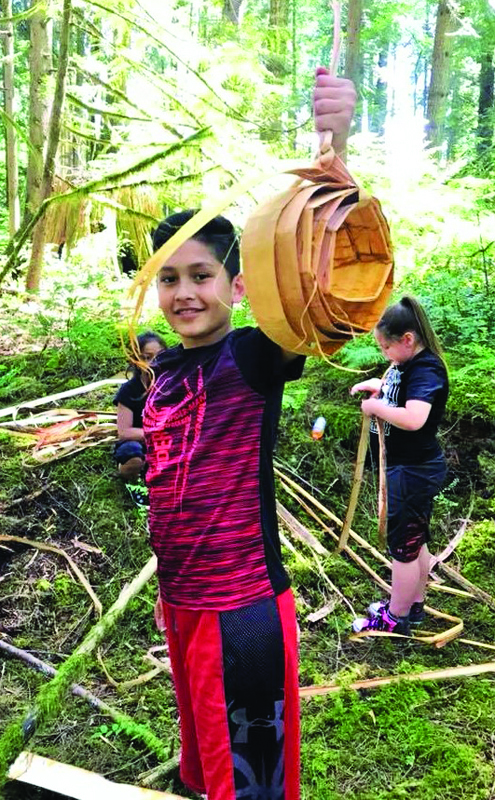 Over the weekend of June 10, the Tulalip Tribes membership was once again presented with the opportunity to participate in the cultural upbringings of their ancestors; specifically by journeying into their ancestral woodlands and using traditional methods to pull, gather, and harvest cedar. Led by Forestry staff from Tulalip’s Natural Resources Department (NRD), participating tribal members ventured into the 10,000-acre Reiter Foothills State Forest located in Snohomish County 30-miles east of Everett, between Gold Bar and Index. 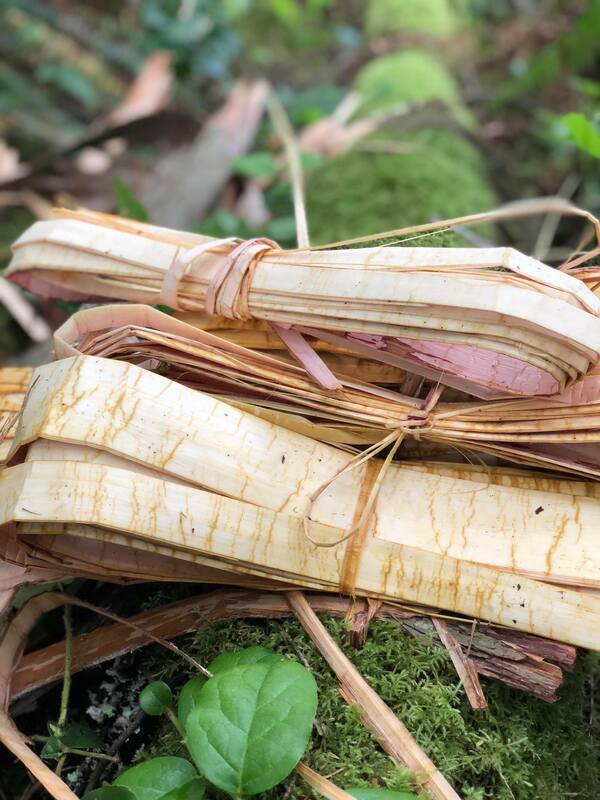 Ancestors of Western Washington tribes relied on cedar bark as a resource for making items for everyday use. Today, tribal members continue harvesting and teaching the handicraft to the next generation by making traditional items such as baskets, hats, regalia and tools. 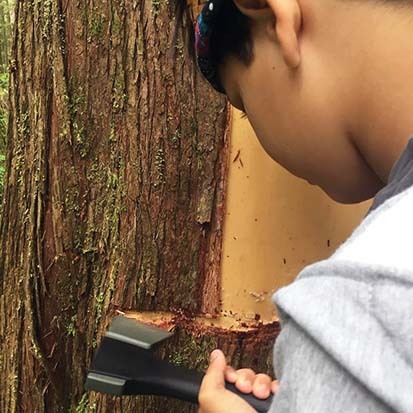 Many Tulalip youth participated in the two-day cedar harvesting event, gathering strips for elders and learning techniques of separating the smooth inner bark from the rough outer bark. For some, this was their first trip to gather cedar. 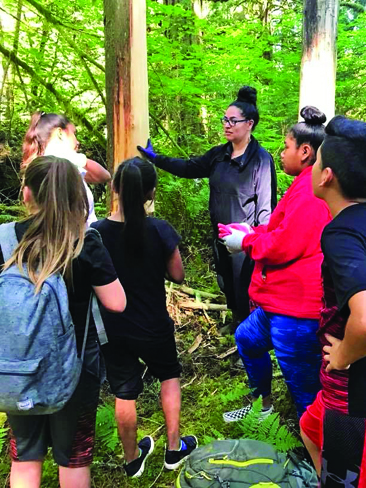 Lushootseed teacher Natosha Gobin was one of the cultural leaders who made it a priority to pass on the teachings of cedar harvesting. 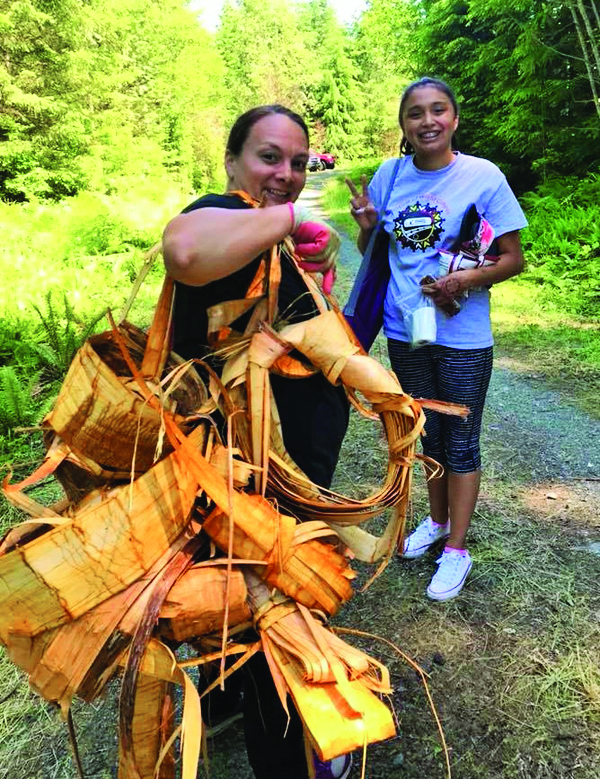 She guided five first-time cedar gatherers whose energetic spirts and eagerness to learn made for a memorable experience. 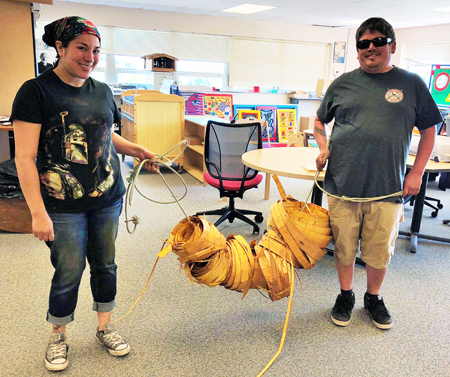 Kylee Sohappy, Martelle Richwine, Kane Hots, Oceana Alday, and Xerxes Myles-Gilford were among those first-time gatherers receiving instructional guidance while offering their support to stock pile cedar for future projects.